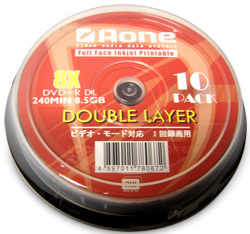 The introduction of Double Layer burning capabilities, which are now implemented on almost every DVD writer, has meant more and more people using Double Layer media. This new printable 8.5 GB high capacity Double Layer DVD+R media is designed to support newhigh-performance DVD+R drives that conform to double layer recording standards. This Double Layer DVD+R media can store up to 8.5GB data or 4 hours of DVD quality video without the need to turn over the disc. 10 . Aone . DVD+R . Double . Layer . inkjet . printable .